The equity shares of the company are listed at the Bombay Stock Exchange Limited(BSE) and National Stock Exchange of India Limited(NSE), Mumbai. The Listing fee has been paid up to date, to the above stock exchanges and are actively traded in both exchanges. Last 3 Years Complaints (if any) – NIL. 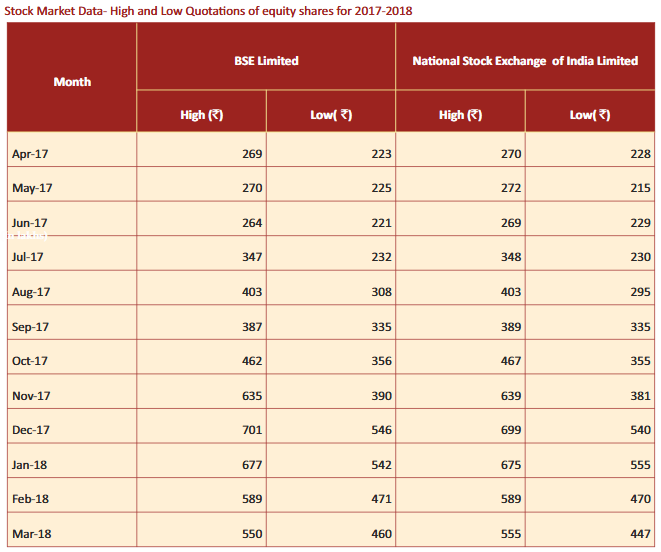 Listing info - Equity Shares are listed at BSE & NSE in Feb 2010. We furnish below a statement of unclaimed dividend as on our recent AGM i.e, Jul 26, 2017 for your information. Please find enclosed the statement of unpaid dividend as on Dec. 31, 2017. The company has no subsidiary.